I was on a roll, finishing up the 2-pagers from our Canada trip. So I kept going and whipped out this spread from our Portland trip in March. I kept everything really simple. 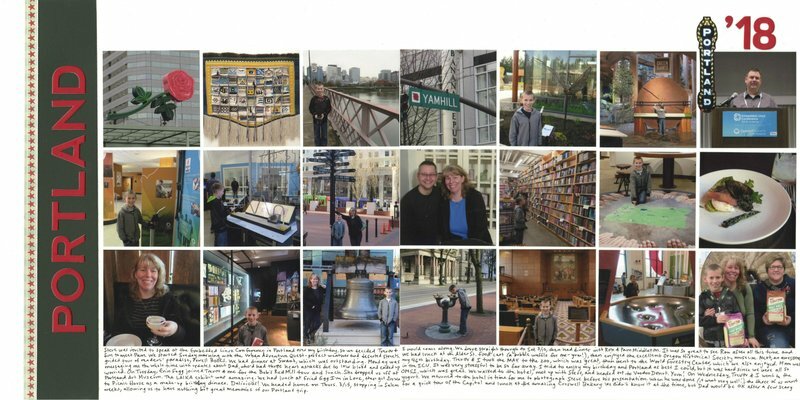 All the photos are in a grid, except for the Portland marquee that I fussy-cut and used as an embellishment. I put the title on black cardstock, accented it with a tiny strip of patterned paper, and put the year in the top right. Then I wrote a ton of journaling. As I've mentioned before, I keep a daily journal. Normally, I use it as the source for my journaling on a layout. It helps me capture my thoughts and memories from when they were fresh. But in this case, I veered away from that a little bit and allowed the passage of time to guide part of my journaling. Midway through our trip, my dad was admitted to the ICU. It was a very scary time and it was hard to fully enjoy the trip. Now that 8 months have passed and my dad is doing great, I was able to include that in my journaling. Another fabulous collage/grid style tarvel layout! Sure - I'll get around to yours once I'm all caught up with mine! You can expect your completed layouts back in a couple of decades or so. Hahahahahahahahaha! Okay, now I don't feel so bad! BTW - I know how to spell "travel", in case you were wondering ::doh::! Well done! I love your travel spreads.